The U.S. government may be in partial shutdown mode, but operations to configure instruments critical to NASA’s InSight mission on Mars are right on schedule – and things are going swimmingly, as the latest mission update attests. Our last update from the InSight mission came on December 20 following the probe’s successful deployment of the SEIS instrument, or Seismic Experiment for Interior Structure, onto the Martian surface. The configuration of this hexagonal-shaped device is still ongoing, but an update from the SEIS team shows things are proceeding as planned. Over the last several weeks, mission engineers have levelled the seismometer, manipulated the cable connecting InSight to the device, and – most importantly – balanced three of the instrument’s six internal seismic sensors, while also confirming their functionality. Once SEIS is up and running, it will scan for seismic vibrations, offering a glimpse into the Red Planet’s internal activity. The hexagonal device rests passively on the Martian surface, and a tether connects it to the InSight lander. SEIS should be able to detect the slightest vibrations, including those caused by Marsquakes or the thumps of a meteorite impact. Once this important data is transmitted back to Earth, scientists will gain a better understanding of the material that first formed the rocky planets of the Solar System, and possibly learn if liquid water or plumes of active volcanoes lie underneath the Martian surface. 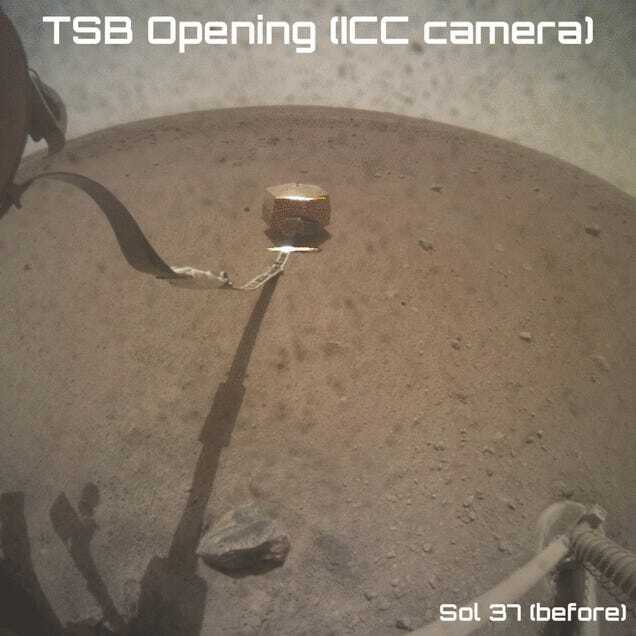 Soon after InSight’s robotic arm placed SEIS onto the surface, mission engineers learned that the device was resting on a slope angled at 2.5 degrees. In full anticipation of this, SEIS is equipped with three configurable legs, each of which can be commanded remotely to orient the device along both the horizontal and vertical planes. An operation to level the instrument on December 27 was a success. SEIS is now perfectly level with the Martian surface, but it’s standing too high. The next step, called “levelling low,” will see the device moved as closely to the Martian surface as possible for optimal data gathering results. Currently, the seismometer’s legs are at the midpoint position, so mission engineers have room to work with. Once it’s as low as it can go, the device will be horizontally levelled once more. The VBBs are pendulums mounted on pivots that are as nearly frictionless as possible. When the ground moves, it sets the pendulums in motion as well. But the motions they’re seeking to detect are incredibly small, so small that to have any hope of detection, the VBBs have to operate in a vacuum and perfectly level. Mission engineers commanded the VBBs to centre their pendulums on December 31, but they didn’t receive confirmation of the results until January 2 – news that was “greeted by bursts of applause,” according to to the SEIS team. The fragile VBBs survived atmospheric entry and landing on Mars, and they’re collecting good data. Finally, the mission engineers have had to do some cable management. The tether that connects SEIS to InSight expands and contracts dramatically owing to significant temperature fluctuations over the course of the Martian day-night cycle. Needless to say, a cable that shuffles around on the surface, and is also connected to a seismometer, is not good. This could interfere with data gathering by introducing unwanted noise. The team has literally spent weeks trying to figure out the best orientation for the cable to isolate it as much as possible from SEIS, which they’re doing by trying to create lots of slack. A decent configuration was achieved by the first week of January, but the cable management process is still incomplete. The mission engineers need to ensure that the tether is pinned securely to the surface. To that end, a scoop on the end of InSight’s robotic arm will be used to orient a weighted block, or pinning mass, to prevent wind from blowing the tether around. So yeah, lots to do! In addition to performing more cable management work, the mission engineers will place the dome-like wind and thermal shield over SEIS to protect it from the elements. The mission is currently on schedule, and scientific data collection should start in February.